There is an enormous amount of sports available to visitors in the island of Ibiza, and being next to the sea and close to the countryside and other towns, it has many activities to tempt all lovers of the outdoors, in particular Ibiza watersports. The conditions for windsurfing in Ibiza are not extreme and therefore this makes them an excellent place for beginners to enjoy this sport and pick up some of the basic techniques. There is also a small school that gives lessons in windsurfing and hires equipment. Sailing is the most popular of all watersports in and around Ibiza and there are several high-profile events, attracting many of the world's leading sailors. These popular sailing events are held in Mallorca and include the King's Cup and also the Princesa Sofia Trophy. Almost every coastal town in Ibiza has its own marina, full of yachts from all over Europe. In Ibiza, boats can be chartered for a period of days or weeks, or can even be rented by the hour on some beaches in this coastal resort. 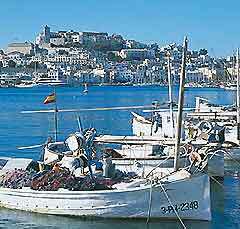 The waters of Ibiza are absolutely full of fish and this is an excellent sport for fishing, although this is not a particularly popular activity in Ibiza. There are however several agents that organise fishing trips and these are usually very productive and enjoyable outings. The coastal seawaters that surround the island of Ibiza are clear and clean, with an enormous variety of sealife just below the surface. Conditions for diving and snorkelling are ideal and this is a popular sport in Ibiza. There are scuba diving courses available for beginners and people hoping to dive in the deeper waters must already hold a diving certificate. Snorkelling in Ibiza provides a much cheaper option than scuba diving and is an equally exciting alternative. The beaches of Ibiza are sandy and the water is ideal for swimming and bathing. In the high season, most beaches employ lifeguards and there are also good facilities, including volleyball courts. Many Ibiza beaches can become busy and so it is often worth arriving early to avoid the crowds. There are many other watersports available in and around Ibiza and these include high-speed water bikes, paragliding behind speedboats, water-skiing, rubber rafting behind speedboats and also sea-kayaking. Hiking around the island of Ibiza and the other Balearic islands nearby is becoming a popular pastime and the hilly regions provide excellent places for hiking in this area. Golf is a major sport in Ibiza and there are many golf courses in Mallorca, Menorca and Ibiza. Set in beautiful surroundings, these golf courses provide excellent facilities and stunning views. Equipment is available for hire and golf lessons should always be booked in advance. There are several riding schools on the Balearic islands and these provide good facilities for both beginners and more experience riders. With scenic riding trails available, all horse riding is done under the supervision of an instructor. Regular horse races are held on the islands of Mallorca and Ibiza and these events are usually very popular and well supported. There are numerous places to hire bicycles on the island of Ibiza and these are usually inexpensive. Cycling is very popular and provides an enjoyable way to explore town and travel around Ibiza. There are also many interesting trails for mountain bikes.